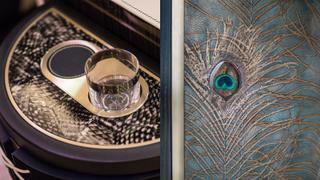 While best known in the yachting industry for being the studio behind the design of yachts such as Madame Gu, Dilbar and Plvs Vltra, Winch Design also has a wealth of experience in interior design for residential properties and private aircraft. 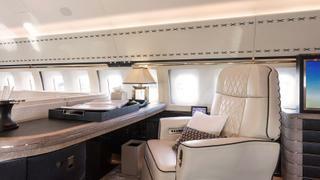 One of its most recent projects was the interior design of a Boeing Business Jet B737-700 for a private client. 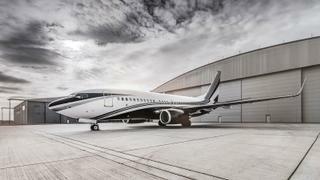 Here Winch Design's head of aviation Jim Dixon talks us through the design of this incredibly luxurious jet beginning with the distinctive livery, which he comments 'gives this BBJ maximum 'ramp appeal''. The luxurious bedroom features electro-dimmable lighting and an impressive 64-inch television — the largest currently offered for a certified aircraft interior. 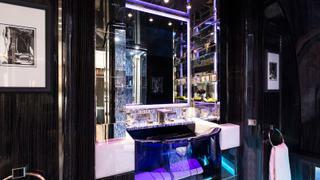 The owner’s bathroom is pure drama; a custom-made blue glass washbasin is the centrepiece to a sanctuary of rich dark veneer, large shower and a mirror-faced TV magically integrated into the marble vanity area. Guests can enjoy a drink at the under-lit bar with its ingenious high-low bar stools and hidden champagne cooler. The whole area is equipped with full spectrum, audio-synced lighting. There is a stately desk area where the owner can continue his formal business in one of the bespoke, finely-upholstered butter-soft leather seats, with the most wonderful hand-stitched details. In the main lounge area, a long, elegantly detailed shagreen table unfolds and extends to comfortably seat five guests. With a fold-away buffet counter complimenting the table, the whole area is designed to accommodate a small banquet. 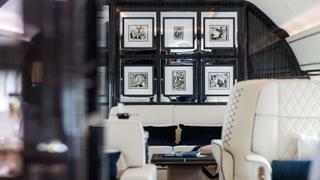 The design brief for this interior was to create a relaxed ‘flying home’ and a carefully-selected collection of artwork provides the finishing touch, creating a residential feel which goes miles beyond any typical private jet. The galley, cabin crew facilities and guest bathroom are all neatly integrated in the forward area, concealed behind sliding doors, precision-engineered within beautiful peacock-themed metalised artwork panelling. Rich, dark veneer and bronze metallic detailing throughout also creates a tactile interior which is powerful, sophisticated and unapologetically masculine in spirit, whilst feeling elegant at every turn.